This article is about the 2010 remake. For the original TV series, see Hawaii Five-O (1968 TV series). 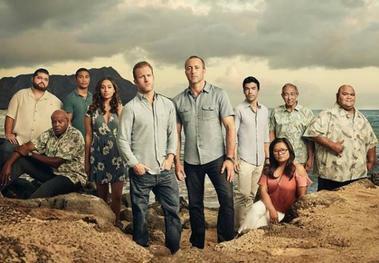 For the current season, see Hawaii Five-0 (2010 TV series, season 9). For other uses, see Hawaii Five-O. Dennis Chun as Sgt. Duke Lukela (season 8 – present; recurring previously), HPD officer who often acts as a liaison to Five-0. He was one of the few HPD cops who was not antagonistic towards Danny or the other Five-O members from the beginning, as he was colleagues with Steve's father and also personally knew Chin and Kono's family. In "Hookman", he was shot by Curt Stoner (Peter Weller), but survived and recovered. Dennis Chun is the son of Kam Fong Chun, who played Chin Ho Kelly in the original series. Wikimedia Commons has media related to Hawaii Five-0.